1. Information necessary for understanding of the current market and history of its problems. 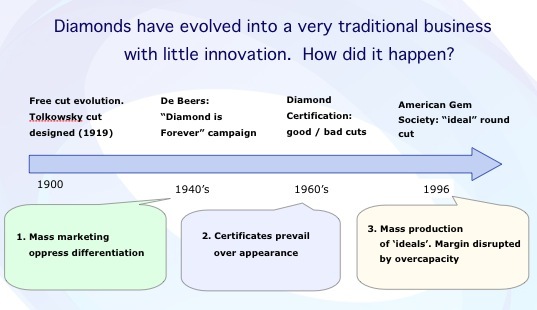 Why does diamond – the ultimate luxury product – loose out so badly to “other luxury goods”? Is it because other luxury industries (expensive cars, high fashion, yachts, etc,) practice technical novelty, fashionable brands and customization, while diamonds has evolved into a very traditional business with little innovation? 2. Modern brand is impossible without innovation. Only cut could bring innovation to diamond business. During the last 10 years OctoNus prepared technological innovations to enable design of new ‘custom-tailored’ cuts on request - adapted to individual customer needs as well as to the uniqueness of each stone. As a result of Diamond Cut Study research in gemstone optics, human vision and psychology, OctoNus now owns hardware and software tools for such a development. New diamond CAD software by Octonus paves the way for the development of new parametrical models of diamond cuts. Real and newly designed virtual stones can be represented as static and dynamic "photorealistic visualizations". The software enables brilliance, fire and scintillation to be assessed numerically using a uniform scale for all cuts. An operator can automatically optimize chosen cut parameters within a given range of proportions for any cut to reveal the highest performance combinations. Enables to view of 3D models with inclusions, obtained from diamond scanners such as OctoNus Heluim or Sarin. Manufacturers can use GAI to sell diamonds to downstream buyers. Buyers will be able to open and compare multiple stones on their own computer. Buyers will download free software as they currently do to access Gem Adviser files. OctoNus has the following proposals to raise revenue to cover the cost of this project. OctoNus and its partners conceived and hosted the 1st International Diamond Cut Conference in Moscow in 2004, which was attended by all major labs except one, and leading researchers and manufacturers.